I'm working on a subscription user journey. Most of the subscriptions are for digital products. However, a few of them may have a print included in the package and we would need a delivery in this case. 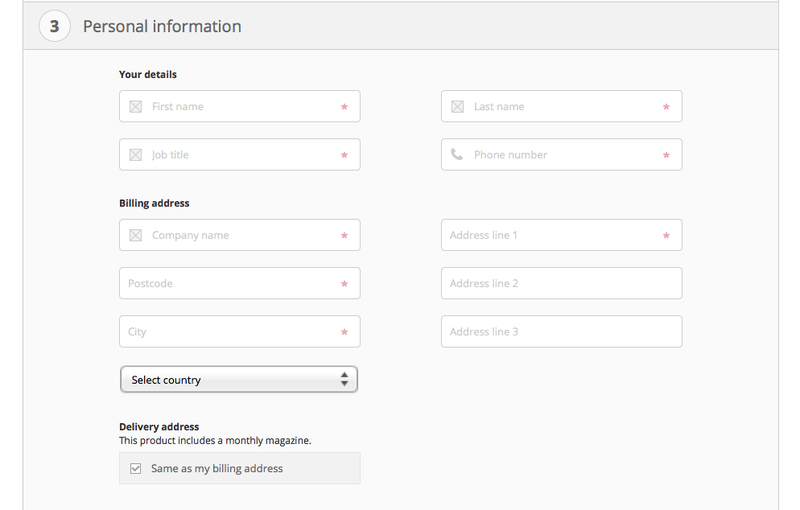 I've placed a 'Same as billing address' checkbox below the billing address section. This checkbox is ticked by default. If the user wants to enter a different delivery address, he needs to untick that checkbox and all address fields would appear (below are my wireframes). I'm wondering if that checkbox should be ticked or unticked by default. "Most of the subscriptions are for digital products. However, a few of them may have a print included in the package and we would need a delivery in this case" Most users don't need it - don't show it. Show it only on demand or make it obvious as optional. It makes your form more convenient, more readable, more task-centred and thus more ease to use. It is a convention to have this option ticked, Take a look to big commerce websites like Amazon or Ebay. Hide it for all digital subscriptions. Show just the button, ticked by default, for physical products, with the form fields showing up if the user un-ticks the button. 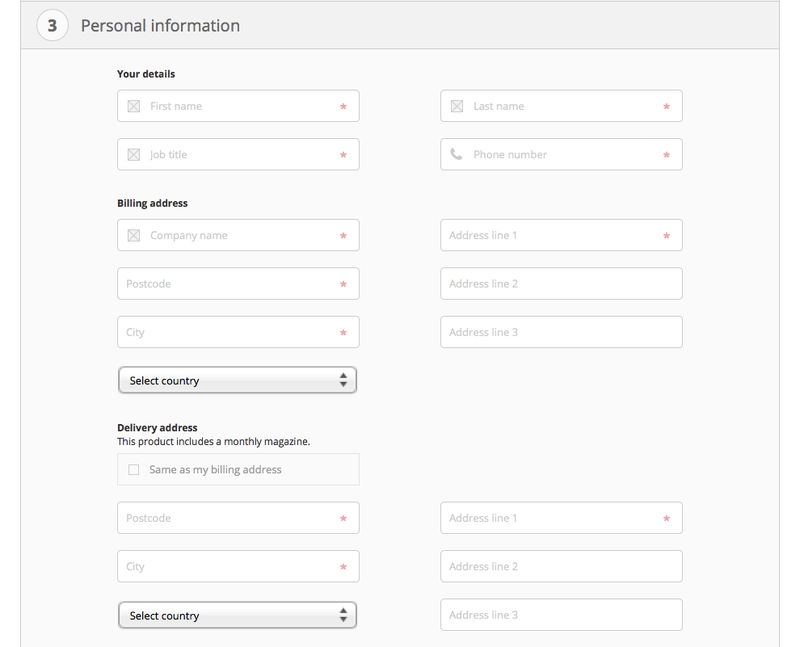 If a user has a different billing address and shipping address they are usually looking for 2 sets of forms to fill out. If there is only one, they will find out why. But for most people they are the same address so simplifying the form is better. Considering usability and UX, you design for probability and not possibility. However you have to take care of the possibilities too. This is a interesting case, Although I see it as an excellent case for user study, A-B testing etc. but I will make a guess. If most of the content you offer is intended to be consumed by self, chances are the users will keep the both addresses same. On the other hand, if primarily user's transactions are for gifting the item then you'd want to design your UI separately. The problem I see with the auto selected Checkbox is, it increases the chances of getting it skipped over. This will result in incorrectly assigning your billing address same as delivery address. If most of your content is digital then users may not expect a delivery of anything, so this increases the chances of it getting skipped over. You might want to look into emphasizing this fact it contains something for delivery. Also, for mostly digital content, would you need a separate set of address? Otherwise, for special cases like this, you can make a clear distinction of the delivery component. This is partially anecdotal, but having filled out tons of forms, many that have shipping AND billing addresses, and having had both situations where they are the same and different, you want to make it as easy as possible. My suggestion would be after filling out the billing address offer two buttons: Use Billing Address for Shipping and Enter Shipping Address. This means the user will have to decide which they use (and is less likely to accidentally select the wrong response). However in the event they are the same the user won't have to type it again. Additionally for digital only products putting consider a third button No Shipping with a note nearby that says something like "Hey, since this is a digital product, we can skip this step in the form." There is a measure of satisfaction when things end up being easier than expected, especially in an area like online forms where the expectation is usually for frustration and user-unfriendliness (and possibly having to keep alert for Dark Patterns ... no I don't want your newsletter). Not the answer you're looking for? Browse other questions tagged forms input-fields ux-field or ask your own question. Is 'billing address' required for e-commerce checkouts? How to improve billing address pattern?